This is where we’re headed with the baby’s room. So far the walls are painted. We have the chair, which might be painted. 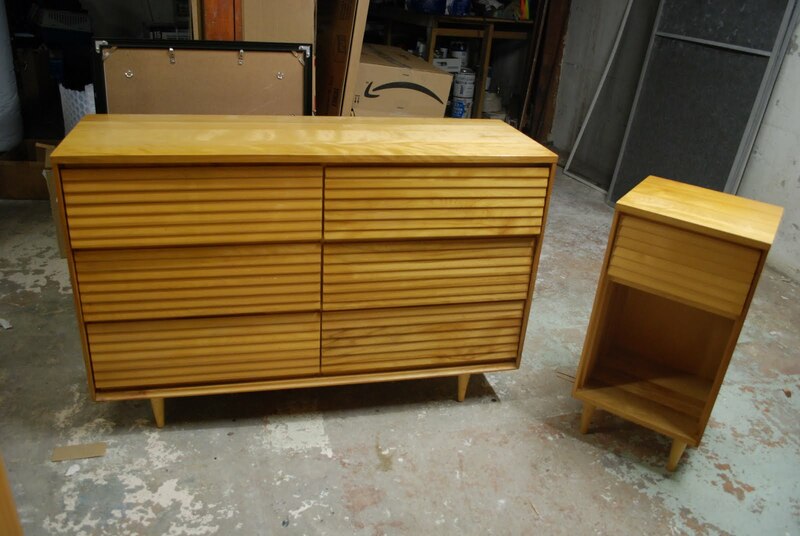 We have the dresser (below), which will be painted a yellow similar to the dresser above. We may or may not have a crib. Window shades will be ordered this week. We’ve purchased and framed the submarine print (that giraffe!) We need to find a rug- looking for something not super expensive, ideally natural wool or cotton. Possibly gray, maybe brown or tan. Suggestions? So, we have some projects to tackle. The goal is to have the room just-about-done by mid-March so that we can focus on the final preparations and enjoying some down time before the new member of our family arrives. Dresser and nightstand (which will be a side table next to the chair) via Craigslist. I'm glad our dresser inspired you! Please let me know when you post finished pictures of your dresser; I'd love to see it! Very cute, I like the color pallet a lot. For the rug: Gray (a gray that has blue in the base) or a warm buff/tan (something with a hint of yellow to the base) of it would be nice I think. So cute and perfect for a girl or boy. Plus, a room that will grow with them as they get older. Also, did I mention it's adorable? Are the curtains made out of the super cute tree-hipo-flower fabric in the back? Thanks for the ideas, Meg! I was leaning towards gray (overstock has some good ones) — looking for some tan as well. 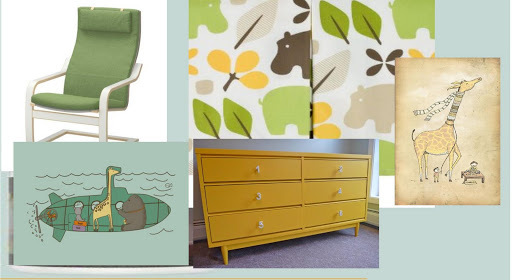 The hippo fabric will be the crib skirt and the changing pad cover- I think we'll go with a solid for the curtains (open to suggestions there, too! ).